Iranian labor Activist Esmail Bakhshi has been arrested again by Islamic Republic authorities after having spoken out against being tortured and abused in the course of his previous arrest. On 20 Jan, hours before Bakhshi’s arrest, Iranian security forces raided the house of civil activist, Sepideh Gholian, who was initially arrested along with Bakhshi in November and was also tortured in the same prison. Sepideh Gholian (right) civil activist and Esmail Bakhshi (middle) and Ali Nejati (right), protesting workers, have all been forced to confess to relations with exiled dissidents on national television in Iran. On the night of 19 Jan and before the two arrests, “20:30” a program on the Islamic Republic of Iran Broadcasting Television aired forced confessions of Bakhshi, Gholian, and Ali Nejati, another political prisoner and labor activist. “20:30” – a show affiliated with the country’s intelligence forces – has aired forced confessions of other political prisoners in the past. The show about Bakhshi, Nejati, Gholian and the labor movement in Iran went on to say that the protesting workers in Iran are being directed by leftist groups in exile who are being supported by the United States. The directors then aired forced confessions of the three activist in which they each confess to having links to outside dissidents and networks of leftist groups. Gholian immediately reacted to the broadcast on her Twitter account stating that the confessions were coerced. Gholian’s lawyer has reported that Gholian’s home was subsequently raided following her twitter statement and she and her brother were arrested. Gholian’s father has reported that his family was attacked at their home. While he and his wife were beaten, his son was thrown in the trunk of a car and taken away. He adds that upon inquiring at the prison about his son status, he was dismissed and threatened with arrest. 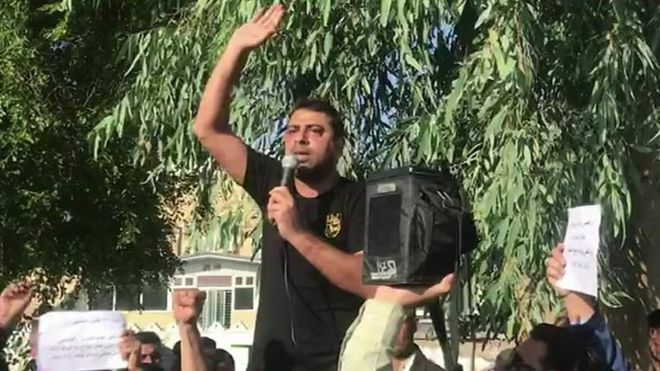 Esmail Bakhshi, a leader of the protesting workers of Haft-Tappeh Sugarcane Agro-Industry was arrested first on 10 Nov 2018. On the same day, security forces arrested 18 workers and Gholian, who had gone to the protest to support the workers. Bakhshi has become an icon of the workers’ protests in southern Iran. In Oct 2018, Bakhshi coined the slogan: “Bread, Jobs, Freedom” which has become the slogan of the labor protests across the country. When temporarily released on a bail, Bakhshi wrote a letter and posted it on social media saying that he was beaten and tortured during 25 days of interrogation in Ahvaz prison under the control of Ministry of Intelligence. Sepideh Gholian also wrote that she was tortured and that she witnessed Bakhshi being tortured. Another activist Asal Mohammadi who was also in custody at the same prison testified in social media that she heard the sound of Bakhshi being tortured. Esmail Bakhshi’s open statements about his torture and abuse during his arrest has triggered widespread support and led to revelations from numerous Iranian political prisoners publicizing their own accounts of abuse and torture in prison by Islamic Republic authorities. The Ministry of Intelligence and the Judiciary in Iran have denied the allegations of torture in Iranian prisons. The authorities maintain that Bakhshi’s statements are part of a plan conceived by the regime’s enemies abroad to tarnish their image. Dezfool Prosecutor has announced that Bakhshi has been arrested following an “effective operation” claiming Bakhshi was fleeing the authorities at the time of his arrest. Bakhshi was arrested in the middle of the night while at home with his family. Special forces in four patrol vehicles raided his house. Mansour Mohammadi Khabaz, Dezfool Prosecutor told Mizan Khabar that a warrant was issued for the arrest of Bakhshi. He denied that the police carried out an armed attack on Bakhshi’s house maintaining that Bakhshi was fleeing arrest and was arrested as a result of an “effective arrest operation”. Haft-Tappeh Sugarcane Workers Syndicate has announced through its Telegram page that police armed forces stormed Bakhshi’s house at 11:55 pm on Sunday, January 20 and arrested the recently released labor activist. They add that Bakhshi has been taken to an unknown location; however, Dezfool Prosecutor has claimed that Bakhshi is being held at the Shush Court of Justice. Media linked to the Revolutionary Guards has also confirmed the arrest claiming that the labor activist was involved in the so-called “torture fabrication project” masterminded outside of the country. Meanwhile, a group of Iranian lawyers have written to Javaid Rahman, Special Rapporteur on Human Rights in Iran expressing serious concerns regarding Bakhshi and Gholian, maintaining that their arrest is in violation of fair legal process. Iranians can only vote for candidates approved by the dictator Khamenei. To run for President in Iran, Ayatollah Khamenei must chose the candidates. Which means if your not a Khamenei supporter you cant run. Iranians want to end this insanity.